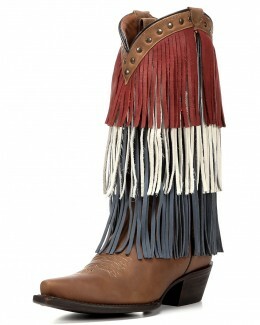 The Freedom American Flag Boot by Redneck Riviera is a great way to show your pride! Covered in stunning details, the base is vintage cinnamon leather. 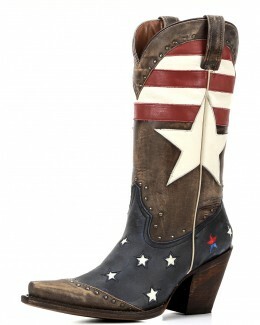 Each side of the upper boot features red and white stripes and a large white star. Navy blue leather and white stars on the foot complete this patriotic boot, and scattered studs provide extra flair. Each boot is handmade by skilled leather craftsmen. The finest leathers are hand-selected with attention to the natural qualities in each hide, so every boot looks and feels great. Each style is stitched with John Rich's Redneck Riviera logo to show your redneck pride. This boot is 100% Leather, features a pointed toe, brown leather Outersole, and a 3.25"" heel. The toe is a snip toe, heel height is 3 1/4", cushion insole, leather outsole, shaft circumference is 13" on a size 7.